The National Rural Employment Guarantee Act (nrega), 2006, is degenerating into yet another poverty alleviation scheme. At the same time, officials are congratulating themselves on the act's performance, and there is even talk of extending its scope. 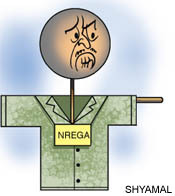 Their exhilaration betrays an ignorance of the contradictions between nrega's intent and ground realities. Under-achieved The prime minister, the Union ministry for rural development (mord) and the Veerappa Moily Administrative Reforms Committee on nrega have sought wider application of the act. To bring actual wages in line with Minimum Wages Act, 1948, mord had asked states to undertake "Time, Motion & Work studies and revise workers' standard schedule of rates. "This schedule of rate entails that workers should be paid against the amount of work done in a stipulated period and not at flat rates per day. But no state has undertaken this exercise. Social audit did pick up momentum but its follow-up is quite another story. Some states did introduce novel measures, but then they were also instrumental in diluting them. Andhra Pradesh, for instance, pioneered the use of information technology in making real time data available to residents of the state. But the state now plans to effect wage payments through dubious intermediaries rather than post offices. Computer-generated cost estimates have given way to direct cash transfers. And the much-publicised social audit in Ananthpur was followed with "instructions" to not undertake the exercise any longer in the district. Basic expectations Communities want work on demand, assured minimum wages and weekly payments. But a crisis of confidence among officials as communities millitates against this. A simple solution would be to transfer funds to a village nrega kitty. The individual payments can then be made through local post offices or banks, based on calculation of work done in a week. In fact, in a pilot scheme in Andhra Pradesh, weekly payment was adopted. As a result, the workforce multiplied ten-fold. Before this scheme, nrega was reaching to only a tenth of the needy in the targeted areas. And before this scheme took hold, those reporting for work could find employment for only 25 per cent of the guaranteed days. The task is to expand nrega to 20-30 times its current reach. For this, priority should be given to the 200 most-backward districts in the country. But the government seems keen on extending the programme to other districts without ensuring wider labour participation and providing more employment days in these 200 districts. The challenge In certain areas nrega has created rural discord. It has led to tension between wageworkers and agriculturists. This disharmony has then been used by vested-interest groups to grab land. Besides, there is enormous stress on agriculture-based livelihoods in our dryland areas. Of course proposals to revive agriculture are on the anvil. But the current belief is that adding a little nrega pie will improve matters. That's wrong thinking. We must understand that communities will participate in nrega only when it meets their expectations--food and nutrition security, better workplace facilities and tools to enhance worker output. W ork they get under the act should not mean regular drudgery. nrega needs a new paradigm. Those running the programme must realise that there are natural resource issues underlying our agrarian crisis. nrega cannot succeed without addressing this crisis. There is actually much in the act that can help address this crisis its emphasis on public investments, for example. A three-year approach to develop fallow lands with a focus on soil in the first year, on water in the second year and on biological measures in the third was successful in motivating farmers and tackling drought leading to sustained crop production in some areas. The challenge in nrega investments for agriculture development and natural resources management is to ensure that farmer suicides do not occur. It is vital that the 6040 ratio of labour and materials must be altered according to specific requirements. While this seems an apt labour/material ratio for development of land, water and other natural resources, in case of development of other resources, it needs to be changed to 9010. When asked what ails our agriculture despite a lot of government measures, dryland agricultural scientist J Venkateshwarulu said, "When I walked on farmland in Ananthpur 30 years ago, I felt a springing sense under my feet. Now, it's like walking on metal road." The "next practices" calls for a reality check under our feet.